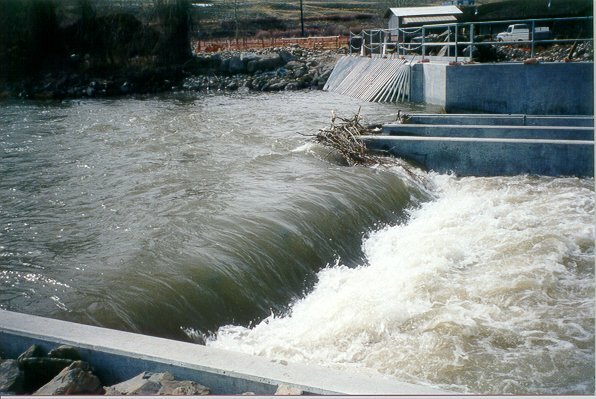 Fish Passage and Environmental Mitigation | Obermeyer Hydro, Inc. The Obermeyer Spillway Gate System may be configured for independent operation of various gate sections. This allows fish-way attraction flows from the spillway, to be directed to fish ladders with a minimum amount of water. Adjustable fish ladders can be constructed from a series of Obermeyer gates. Controlled pond level can prevent the sudden drowning of water fowl nests which often occur when flashboards are replaced. A stable water level and shoreline enhances recreational use and improves aesthetics. Boards, nails, wire, plastic sheet, and roofing paper that are typically used for flashboard construction are kept out of the rivers. Hydraulic oil required to operate other types of gates is not used. Obermeyer gates may be used as "open channel check valves" to periodically fill, but not drain, critical wetland habitat. The overtopping nature of Obermeyer gates eliminates the "suction trap" associated with conventional slide gates that may present a hazard to wildlife.